In the last 75 years, the worldwide Christian Church has seen two movements that have unquestionably transformed the contemporary Christian Church. In a speech, Pope Francis told the charismatics that they their movement was begun by the Holy Spirit as “a current of grace in the Church and for the Church”. The God of Exodus is the God of history and of political liberation more than he is the God of nature. In other words, as theologians and pastors of the Catholic Church turned towards the combination of ecclesial and political action on behalf of the poor in countries around the world, the poor themselves turned to a renewal movement that looked toward a vibrant prayer life and a palpable resurrection of the Holy Spirit. Healings, prophesying, speaking in tongues, miracles–these were no longer events of the past, but possibilities in the present. Ministers did not need degrees from higher education–they needed the Holy Spirit. 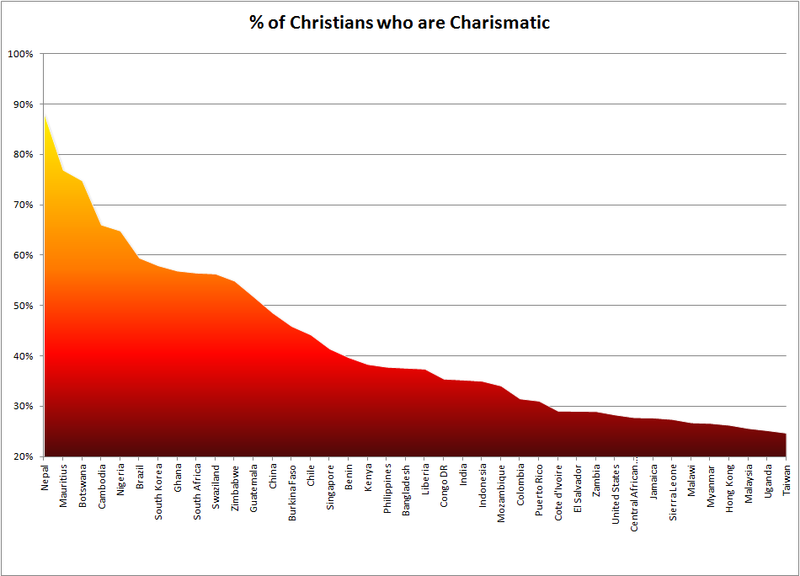 The above graph is pulled from the World Christian Database, and denotes the ten countries with the highest populations of Charismatics (including Pentecostals, Catholic Charismatics, and Neo- or Third-Wave-Charismatics). 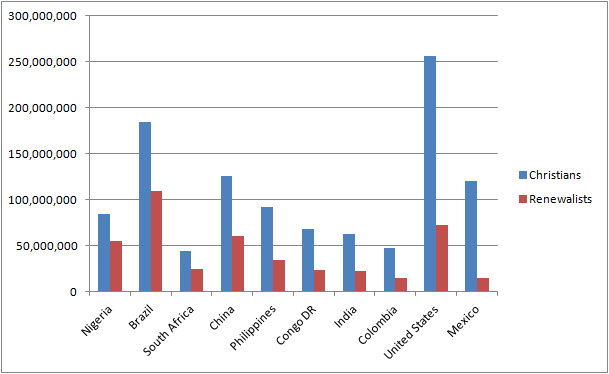 Outside of the US, China, and India, the remaining seven countries hail from the Global South: Nigeria, Brazil, South Africa, Philippines, Congo DR, Colombia, Mexico. The data for this chart is at the bottom of the post. Note the United States, in 31st place. African and Latin American countries make up the vast majority of the list. European countries are nonexistent in the top 40: the UK came in 84th, at 12% Charismatic, just under Canada, at 13%. The answer to this question could fill volumes, but, for now, I find three points of intersection or juxtaposition quite compelling. First, difference in scholarship: Liberation Theology has transformed theological scholarship, whereas Pentecostal Theology has not. One would be hard-pressed find an academic department of theology without someone decently versed in the liberation movement. One would be hard-pressed to find a Christian theologian–especially a Catholic theologian–well-versed in Pentecostal and Charismatic theology. Plenty of people are “familiar” with the movement, but few stand as experts, and even fewer write books illuminating the new ways in which Pentecostal movement can grow. This reflects the dynamics of the two systems: Liberation Theology is a philosophical-theological-political movement largely begun and continued by theologians and pastors; Pentecostal theology is a ground-swell movement that, in its very nature, relies more on the movement of the Spirit than by the teachings of academics concerning the movements of the Spirit. Second, difference in world positions: Liberation Theology has done much to turn the Church towards the poor, and has inspired millions of Christians to devote their lives in service of those who are being beaten by the systems of power in which we take part. Pentecostal Theology, in turn, has inspired nearly a billion people to renew their Christian faith and develop a hope in the practical work of God in their daily lives. Many of these people are poor, and many of them have little hope in transformative political change–thus, for them, Liberation Theology packs wonderful words, but is nothing more than the eschatological hope of Christianity. Liberation theology stands as an incisive call to the privileged of the world that the systems in which we participate are destroying the body of Christ. Pentecostal theology stands as a source of inspiration to the oppressed of the world that God can work miracles despite political injustices, despite inhumanity, despite terrible death. The Holy Spirit is alive, active, and for all people. Quite literally, in the eyes of the movement of the Spirit, all are equal. Third, a juxtaposition of possibility: While Liberation Theology has taken longer to be accepted by the hierarchy of the Vatican, the Charismatic movement has enjoyed a tepid yet growing acceptance in ecclesial circles. I find it intriguing to think of the possibilities of the World Church in 25 years, when the pentecostal movement of the Global Church reaches a point where one cannot separate the Spirit of Fire from the Spirit for the Poor. While academics and pastors–like Francis–will continue to argue for the poor, the Spirit seems to continue moving in the poor towards a renewal of Christianity throughout the world. When shall the two meet, and what might happen when they do? Whether we like Liberation theology, the Charismatic movement, or neither, both movements are here to stay. The only question remains as to how we will approach them, and how their interpretations of the movement of the Spirit will affect our own relationship with God. 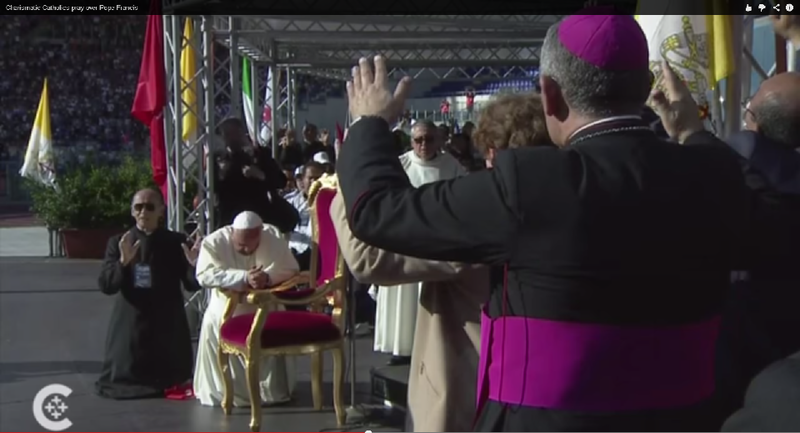 To close, here is Pope Francis, being prayed over by 50,000 Italian Charismatic Catholics. Thanks for this thoughtful post. Do you have any comments on how either of these movements are or are not intersecting with the Emergen(t)(ts)(ce) Christianity movements? My first response was a strong affirmation: yes! this is true and important. It was immediately followed by an intellectual theological concern: how can this be true? Because God loves us! I’m not very familiar with the Emergent Church movements, and the database that was giving me the information didn’t include that category! Is Emergence a descriptive term placed on churches from the outside, or something that churches or people claim for themselves (like Charismatics or Pentecostals)? From this quote, I think your first “Yes!” was the response he was looking for…we cannot possibly consider ourselves in solidarity with the poor unless we truly love them, and we cannot possibly love them unless we wade into God’s love which we find between ourselves as equals. God’s love for us, while “comprehensive,” could also be seen in God’s kenotic act of Christ–an act of love in becoming equal, in taking the form of a slave. I don’t recall whether the Emerging/Emergent/Emergence terminology was self-claimed or devised by onlookers, but having been defined, I believe that it is primarily self-claimed. Brian McLaren is probably the best-known figure in the movement. I heard a great series of lectures on the topic by Phyllis Tickle in 2012, and on that basis would recommend these works by her: Emergence Christianity: What it is, Where it is going, and Why it matters and Embracing Emergence Christianity, a 6-session study guide. I liked her lectures because she presented them from a historical/sociological perspective, rather than as an advocate. Thanks for the fuller context of the Gutierrez quote. I figured that he was talking about human love, but I’m concerned by language that seems to define the nature of love in a way that simultaneously seems to define God out of it. Your notion of God’s kenosis in Christ as a way to solve this is interesting; I can’t quite decide whether I find it convincing because it’s congruent with the radical re-imagining of God brought about by the Incarnation, or insufficient because if God is love, God has to be love prior to the Incarnation, too. Will have to ponder some more!